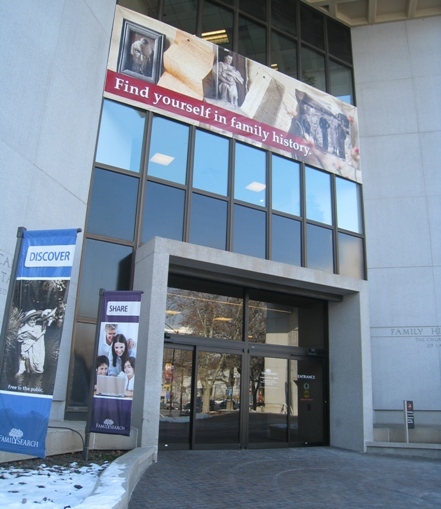 This was my first visit to the large Family History Library in Salt Lake City, Utah, that contains microfilmed records from around the world as well as many genealogy books and other resources. 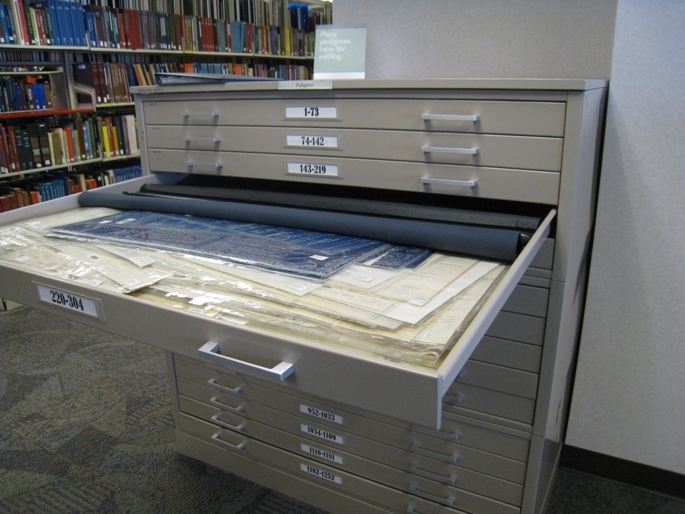 I had prepared beforehand, in Evernote, a list of microfilms and books to explore. These were sortable by the “tags” which allowed me to choose records for one person or family at a time. I also added a tag “Important” in case I had to make choices. I had three days in the library. I knew as the trip grew closer that I would concentrate on several real questions. 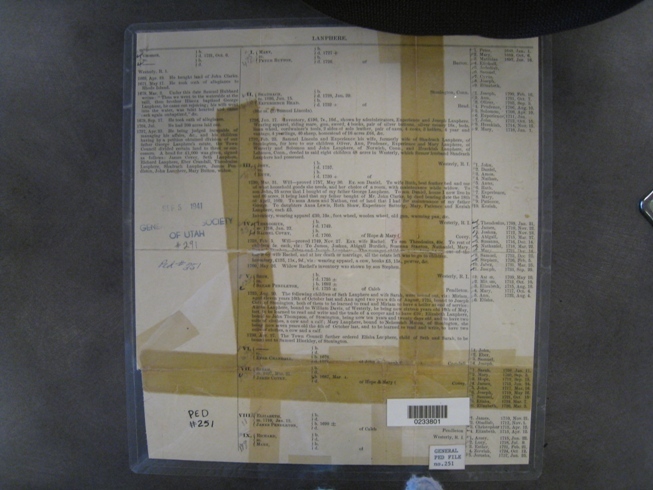 I printed those notes and put them in a paper binder – sometimes it’s easier to rely on paper when you will need to walk around the library or be at a microfilm reader. I did access Evernote on my iphone but ended up NOT bringing the laptop to the library. Next time, everything needs to be on a clipboard or ipad, for portability. The library doesn’t want you leaving valuables around, which is understandable. 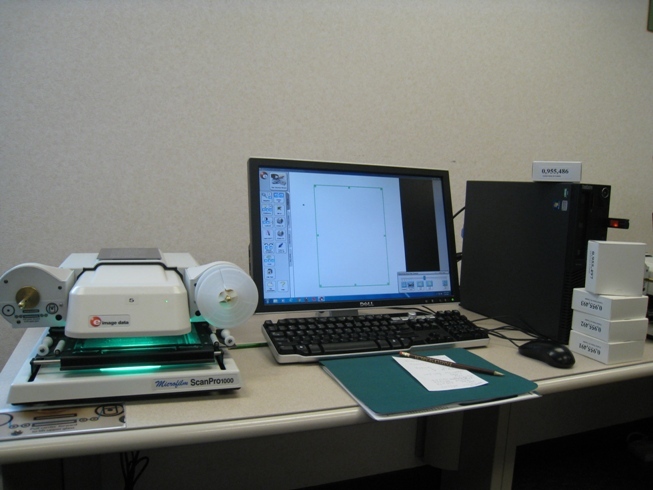 I like the kind of microfilm reader that lets you download each page to your own flash drive. At home, this can be enlarged and manipulated better than printed paper or photos. So I started at a regular reader, but planned to utilize the computer-reader whenever I found something. Because the library was unusually quiet during my stay, I managed to use the computer microfilm reader most of the time. These are the specific problems I decided to explore, and how it went. What I learned: I like to review lesser-known work on the Lampheres. Unfortunately, I didn’t find much work that would be helpful to me at all. One amusing moment was when I sought out the “Pedigree Chart” files, looking for chart number 251 on the Lampheres of Rhode Island. While there were some intriguing charts in there, the Lamphere chart was, I quickly recognized, pages from Austin’s Genealogical Dictionary of Rhode Island. First cha-ching moment: The Westerly deeds were far more helpful. Prior to his death, Daniel Lamphere mortgaged his property to his son Russell, my gggg-granfather. Russell never lived on the property, but he was heavily involved in the subsequent dealings. It took the family about 10 legal transactions, over the next 10 years, to finally dispose of the property. Each transaction was more helpful than the last; listing all heirs by name, mentioning brothers, fathers, wives, widows, current locations, and neighbors. Tantalizingly, some of the neighbors were named “Tefft” which is the surname sometimes ascribed to Daniel’s wife Nancy. I even found names of some Lamphere connections that blog readers have mentioned to me. I’m getting back to them. These 35 pages of Westerly Deeds will need some careful analysis to determine the facts, but I am hoping those facts will be very helpful. I should probably mention that I had travelled to Westerly Town Hall previously to look at these, but not all volumes were available that day. The nice thing about microfilm is that ALL volumes should have been microfilmed, and be available. What I learned: I found the probate records for Asa Aldrich and I finally realized that his controversial will had produced legal records in TWO states, since Cumberland, Rhode Island and western Wrentham, Massachusetts are adjacent to each other and family members lived on each side of the border. So I saved all those records. I also found guardianship and probate records for Elias Darling, grandfather of Ellis Aldrich Darling, which answered some questions about his life. What I learned: I have a continuing question in my mind about why the famed Rhode Island genealogist, James Arnold, didn’t leave a volume behind about the Arnolds. I once saw an ad that claimed he was researching such a work. I knew some of his papers are housed in the archives at a local Providence library branch. I was happy with the chance to easily see some of them on microfilm, and they were interesting, but didn’t relate to the Arnolds. Oh well. The Arnold book [Benson, Richard H. The Arnold Family of Smithfield, Rhode Island. Boston: Newbury Street Press, 2009] has helped me tentatively identify Lucy Arnold. I would like to learn as much as possible to help me confirm that. Unfortunately, I still have not found a probate record for her father. But in the many, many deeds I found for her father, there is a great deal of information, still to be completely analyzed. Second cha-ching moment: One set of clues involves the identity of Lucy’s mother, who is possibly a Smith. I found several deeds relating to a certain Smith couple (a physician and his wife) and the last one, interestingly, says that the woman is now a widow, old and inform, and is transacting some kind of real estate deal with Thomas Arnold. I’m hoping that deed will help me find further clues that actually prove who Thomas’ wife, Rachel, is. It would be nice to prove something that wasn’t known in the NEHGS publication! I am also hoping that something about these deeds helps me determine my more immediate question about proving a link between Lucy and these parents that goes beyond name and town. What I learned: The abstract of Richard Ballou’s will, that I’ve seen, was correct. He does not name his heirs by name, just groups them as “my heirs.” So that gave me no clues about the later life of my ggggg-grandmother Mercy Ballou. There was nothing in here that helped, and the map was badly photographed, so was no better than my own imperfect photos of an old Cumberland property map I made at the Rhode Island Historical Society. I should really be using these films more, through rental at my local Family History Center (now called FamilySearch Centers). I copied a number of index pages for my family names to help me order microfilm in the future, if needed. 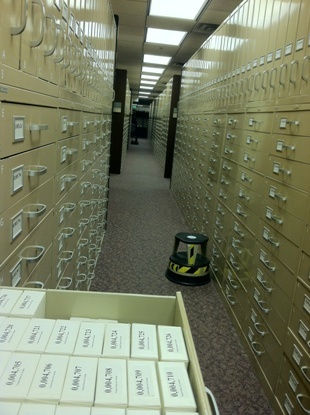 They have a crazy amount of microfilm there. I should keep more careful track of books and microfilms as they are released on the web at FamilySearch.org. As I kept seeing so many people sitting for hours at the computers, I wondered at so many going to the trouble to visit just to use free access to various genealogy web sites. Then I tried, on a whim, looking for records of my gg-grandmother Catherine Young, born in Surrey, England. An 1841 British Census record came up, from a site I have never paid for, and then I really got it. It’s nice not having your search limited by subscriptions. No one wants to subscribe to everything. All the records I found need to be carefully abstracted and analyzed. For instance, I need to eliminate deeds that refer to others with the same name. Three days at the FHL is worth several months of what I’m doing at home. As more materials are moved to the web, that is bound to change. Thanks to Randy Seaver for making me aware of the Family History At A Glance – Family History Library Research booklet, which was helpful. I would also suggest people refer to the FHL website to plan a visit. I’m going to the Salt Lake library next week and appreciated your insights and photos. They should have 20 microfilms I requested pulled and ready for me to look at! If I am lucky, I will have a ka-ching moment or two! Good luck, Steve! Thanks for the note. Thanks for your excellent observations! In two weeks I’ll be accompanying my husband to a conference in Phoenix and already started preparing for the opportunity to use the Mesa Family History Library. I’s not nearly as big as the Salt Lake City library but is certainly larger than the local Flagstaff FHL. I’ve also blocked my calendar with the times of their free classes. I practiced the use of my Flashdrive at the local FHL library so that I’m proficient and am refining and organizing my research list. You’re the 2nd person I’ve heard talking about using Evernote recently so I got a password but am looking forward to some more training on what appears to be a great tool. Thanks again for the wonderful tips! How wonderful that you were able to make the trip. Note to self: If I ever go, have a plan of action. Diane, how lucky you were to have the opportunity to get to Salt Lake City to see the Library! And, as others have mentioned, the planning obviously seemed to help you stay focused on what you wanted to find. I’ll look forward to hearing how you’ve analyzed all the other great material that you now have, and how you begin to incorporate more or the FHL sites for research. Wonderful trip! So pleased you had some ca-ching moments. It’s a fab library. I’m excited about my forthcoming visit. I spent three days from open to close at the FHL about 10 years ago. This was before so many things became available on line. I loved it!! I could see microfilm when I closed my eyes to go to sleep at night but the experience and the information that I obtained was incredible. Now I try to get films on loan when I need them and look forward to another trip in the future. Thanks for sharing your experience. It got me thinking of what films I need to order…..
Nice, Diane. I haven’t had a chance to read it all yet, but in february I’m doing a presentation on Evernote for the genealogical society and in March I’m doing a “planning a research trip to the FHC.” I’m going to take your “important” idea (with credit). Lovely to see how you planned, Diane – obviously all that initial planning helped immensely. Your photographs are very intriguing too – don’t you love to see images of documents. Thanks for posting about your successful trip!